The City Council on Tuesday approved declaring the Eagle Rock home where Ben Affleck and Matt Damon worked on the award-winning movie “Good Will Hunting” a historic-cultural monument. Also granted landmark status was the Donnelly House, a Folk-Victorian home that was moved to Garvanza from Chinatown to save it from demolition. 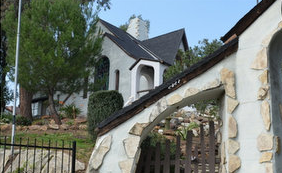 It was the architectural style and history – not it’s Affleck-Damon connection – that convinced city officials to declare the Egasse Braasch home on Eagle Rock’s Hill Drive a landmark. Built in 1923, the two-story single family residence is classic Storybook style architecture with the house resting on a hilly terrain. The building was designed by French architect Jean L. Egasse for local businessman Albert Braasch and his wife Constance; this home appears to be Egasse’s first full-scale home project. The property was sold by the family to Ben McNaughton in 1979 who rented out the house to various tenants – including two upstart writers-turned-actors. The Donnelly House, which was moved atop a steep slope on Avenue 64 in Garvanza, was built circa 1870s-80s but its first location is still a mystery. Records do show it was in Chinatown, on land owned by then mayor of Los Angeles Prudent Beaudry, when John Donnelly lived there from 1886-1920. Through the years, the house has shifted locations and has seen its share of remodeling attempts. It passed many hands but in 1982 the now-defunct Community Redevelopment Agency (CRA) identified the property in a historic resources survey. After substantial renovation, the Donnelly House now sits at the top of steep stairway. A single triangular gable, at the roof center, contains a round vent, fish-scale shingles and decorative woodwork at the apex, according to the monument application. The full front porch is supported by wood posts with decorative brackets. Inside, the house features wainscoting, hardwood floors and built-in cabinetry.